::Download Scientific Description:: ::Project Researchers and Highly Qualified Personnel:: ::Project Progress Summary:: ::Project Scientific Progress:: Semiconductor compounds composed of three elements, specifically CuInSe2 and CuInS2, have been considered for photovoltaic applications by the scientific community because of their interesting optical properties which allow for greater than 99% of the incident photons to be absorbed within the first micron of the materials. Since less material is needed to absorb all the light, less expensive thin films may be used. Depending of the Cu/In ratio, these compounds display what is called n-type behaviour or p-type behavior, both of which are necessary for a solar cell to function. However, the control of these ratios is a major difficulty; indeed, most of the CuInS2 fabrication methods (that often use costly vacuum and/or high temperature processes) reported in the literature yield material with p-type behaviour. 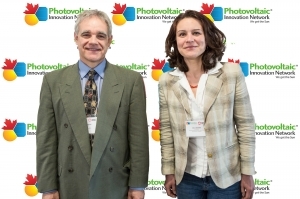 left to right: Professor Benoit Marsan (Project Leader – Université du Québec à Montréal) and Professor Clara Santato (Co-Investigator – École Polytechnique de Montréal). This project aims at developing low-cost, highly efficient and stable thin-film photovoltaic (PV) cells based on the junction between p and n-type nano -structured Cu(In,Al)S2 semiconductors synthesized using a recently patented colloidal method. The term “nano-structured” indicates that the interface of the two types of materials is not uniformly flat but rather, has a very small-scale three-dimensional geometry. Colloidal methods use arrangements of very small particles of materials, hundreds of nanometers or microns in size, to achieve a nano-structure. This unconventional PV architecture will take advantage of the very interesting possibilities offered by this novel method. For example, decreasing the content of indium in the material will lower its cost and most probably will contribute to enhance the cell efficiency. 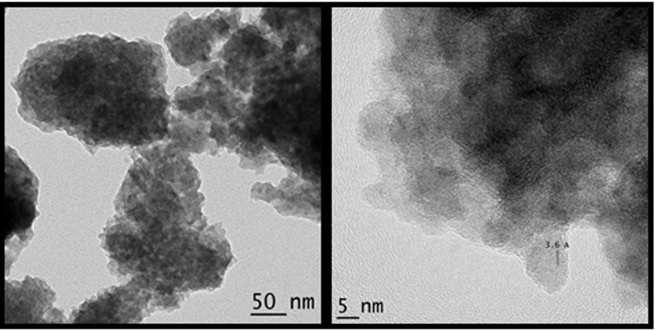 There is also the possibility of preparing Cu(In,Al)S2 with both n and p-type behaviour and this allows us to replace the conventional and toxic CdS n-type layer in the cell architecture. The specific objectives of the research are: (i) modification and optimization of the original synthesis method, optimized to obtain n-type Cu(In,Al)S2 particles, to obtain p and n-type nanosized semiconducting Cu(In,Al)S2 materials with the appropriate properties; (ii) deposition of Cu(In,Al)S2 thin films (both p and n-type) on various substrates, using aerosol jet deposition technique, and optimization of the deposition parameters; (iii) preparation and optimization of the Cu(In,Al)S2 p-n junction (successive p and n layers); (iv) fabrication, characterization (under dark, light of varying wavelengths and white light conditions) and optimization of PV devices of increasing surface area (1-100 cm2); and (v) evaluation of the device stability under white light (AM 1.5) conditions at 60°C. It is anticipated that device energy conversion efficiencies above 10% will be reached.